Transforms your iPhone into a lightsaber, all for a measly zero dollars. When it comes to the best free iPhone Apps, there's AIM, AOL Radio and PhoneSaber, the latter of which has dominated the download charts since it launched July 11. For the price of zero, you can transform your iPhone into a lightsaber and have pretend battles with your friends. Sure, observers will quickly collect their loved ones and flee in nerd terror, but again, you'll have a frickin' lightsaber in your pants, ready to go, anytime. Here's how it works. 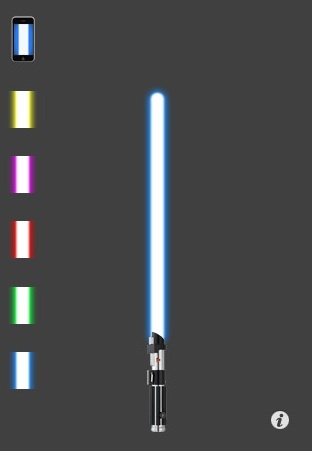 As soon as you activate the App, you'll see a lightsaber hilt on the bottom of the screen and five colors (yellow, purple, red, green and blue) along the left side. Pressing one automatically activates the JEDI weapon and produces that familiar humming noise through the iPhone's speakers. Wave the phone around, even a little, and you'll hear the blade react. Now quickly zigzag your hand through the air and you just engaged an imaginary Sith in an epic struggle to save the Republic. Of course, you'll maximize your enjoyment if your friends download the App, since you'll be able to duel until your iPhones' batteries die. At first, we were too embarrassed to do this in public, but then we'd see each other and immediately whip out our phones and pretend to chop off each other's limbs. Obviously, PhoneSaber is not a game by itself. You have to use your imagination to dream up those epic Star Wars battles. However, the App is so cool (it's currently the 6th most popular free App and way ahead of Facebook) that it begs for coverage. If you have an iPhone, dig Star Wars and hate carrying around that plastic lightsaber, PhoneSaber is the best, most practical alternative in our galaxy. What's Hot: Five colors, excellent motion controls, an easy way to carry a pocket lightsaber. What's Not: Will not save the JEDI order and not handy for aggressive negotiations.